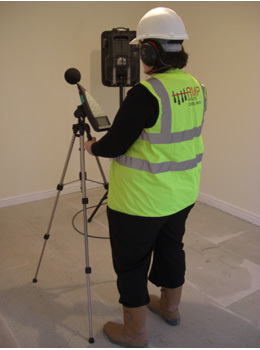 RMP Acoustic Consultants carry out over 100 sound insulation tests per month throughout the UK. All our consultants are members of the Institute of Acoustics and are accredited by the Association of Noise Consultants to carry out pre-completion sound insulation testing to BS EN ISO 140-4:1998 & 140-7:1998 as required by Part E and Section 5 of Building Regulations, Ecohomes and the Code for Sustainable Housing. As well as sound insulation testing on new build residential developments RMP Acoustic Consultants regularly carry out assessments for residential conversions. We strongly recommend that sound insulation testing be carried out on the existing building prior to redevelopment. This allows our expert team to provide tailored advice which can significantly reduce the risk of failure following completion and often reduce the level of material and remedial measures necessary to pass a sound test. Sound insulation testing can be undertaken as soon as the properties reach second fix stage internally and have a sealed external façade. Kitchens and bathrooms etc. do not require to be fitted. A sound test is usually conducted between party walls and floors separating rooms. The sound test procedure involves setting up a noise source in a room on one side of the party wall or floor and conducting noise measurement on both sides of a partition. Once sound insulation testing is carried out, we issue a Technical Report detailing all testing results and giving recommendations on noise control measures if required. We issue ANC certificates for all sound insulation testing carried out in England and Wales, as required by the Building Regulations. All certificates are now issued for post 2010 Scottish Residential Developments.